This event took place in Lospalos on day 101 of my residency, but I am writing this blog post in Dili Airport, day 106, as I prepare to depart. How do you find a way to gracefully and joyously exit a community where you have played some small part for just a small amount of time? ‘Toka Boot’ means ‘big play’ – it was the closest thing we could find in Tetun to describe the idea of a Big Jam, an event where people of all ages could come together to play music. Toka Boot (btw, the second word is pronounced more like bot than boot) was to be an extension of all the weeks of Verandah Jams (and other informal music-making) we’d been doing in Lospalos, but involving many more people, and in a large public space. It was a way of celebrating my residency in the town, and bringing as many people as possible together to do this. It was also a way of sharing the talents of Tony and the ANAM students with the wider Lospalos community. For the last week in particular, we’d been doing creative workshops everyday, in various sites around the town. Toka Boot was a way to bring that all together. There were two parts to the day. The first part, starting at 3pm, was called the ‘workshop’ and was a way to get people involved in learning guitar parts, getting instruments in tune, and also making instruments to play. 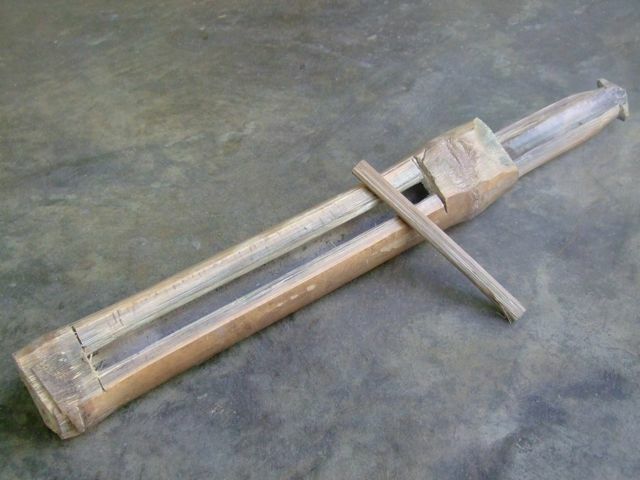 We invited Maun M, our instrument-making neighbour, to come along at 3pm to demonstrate how to make both the kokes and the kakalos, and we brought a large coconut palm leaf and several pieces of pre-cut, stubby bamboo along for him to use as his materials. Sadly, Maun M didn’t make it, so that element didn’t happen, but many people commented that they particularly enjoyed the fact that there were traditional instruments being included in the jam, available for people to play if they wanted to. If this Toka Boot ends up being the first of many in the future, I hope the idea of instrument-making becomes incorporated into the event. I had a tough gig at that moment. Timorese people are notoriously shy, so no-one wanted to be the first to move from the safety of the edges of the space. I kept talking. “Here we have some plastic buckets, but you can play them like drums. Who wants to play the drum or bucket? Come and sit in these chairs here. This next instrument is a shaker. I don’t know the Tetun word for it but in English we say shaker. People who want to play the shaker can sit in these chairs here. On and on I went, introducing each other instruments, designating sections where people could sit, and demonstrating ways of playing the instruments we’d brought with us. Gradually people began to take their places. A group of excitable young boys quickly realised the virtues of the kakalos, and suddenly rushed to the mat where we had laid these out. Bottles and bamboo sticks were similarly popular – it’s the whack-able quality of these instruments that particularly appeals, I think! We also had a sizeable group of young men with guitars who had come along. They sat as a group directly in front of me and did a great job supporting all the music with steady chords. We also had our three sets of chime bars set out along one of the mats, but these were commandeered by some of the Motalori kids (who had been coming to our house every day) and no-one else got a look-in there. Forever Young, as the unofficial anthem of the residency, and with its Fataluku lyrics. So many people had responded with delight to the Fataluku version, and enjoyed jamming on the chords with both the chime bars and guitars, that it seemed an ideal way to end the Toka Boot. We kicked off with some call-and-response rhythms, getting everyone warmed up, listening and participating. From here we established cues for starting and stopping, and ‘tested’ these, seeing if we could get a strong clean stop from the whole ensemble. We began the music jam by creating a rhythmic section A with three contrasting rhythms, a melodic section B that utilised the ‘Melodia Motalori’ on the chime bars, and a sung section C that featured a traditional Fataluku song. (When I’d tried the song out on a local crowd the day before in Cacavei, I’d received a spontaneous round of applause. Given applause isn’t a typical TImorese response to music, I felt like that was a particularly strong affirmation of this choice of song). We switched between sections A, B, and C on a cue from me. We’d hoped that everyone in the space would sing along with the songs, and that they would know the words, but they were pretty quiet. I could see some of the women in crowd singing along, but most of the teenage boys kept their mouths firmly shut! (Afterwards, I asked a friend if perhaps people hadn’t known the words, thinking we should have written them out for everyone. She told me, “No, they know it. They’re just shy!”). These three sections also gave Tony and the ANAM students opportunities to solo or improvise over the ensemble music. Tony playing the saxophone was best-placed to do this, and he alternated between improvised solos, and playing the melodies of each section. I also brought different instrumental sections in and out throughout the jam. The shaker-playing group in particular was excellent at stopping and starting on cue. Other groups were less confident, and tended to stop playing if a group near them was asked to stop. Therefore I didn’t get to play around with variations in texture as much as I’d hoped. We cued a Big Finish from the whole ensemble, and then it was on to Forever Young. This piece took awhile to get going. The boys on the kakalos and bamboo sticks were getting close to out of control – nothing was broken, but it meant that no-one could hear anything much else. Tony and Doug suggested that kakalos weren’t needed for the next piece. While they organised that side of the room, I set about making sure everyone could see a copy of the words to the song. That morning, Tony, Sarah and I had written out copies of the words onto large white poster pages. Now I called for volunteers from the crowd to step forwards in order to hold up the words for people to sing from. We also had two lots of the lyrics up on the walls. So there was a bit of to-ing and fro-ing, trying to start, then stopping because people were still not quite ready. I particularly wanted to establish the idea that the instrumental sections would be different to the singing sections – if everyone played their instruments while we were singing then no-one would be able to hear anything. Finally, I got my eye contact going with the guitarists and the chime bars at the same time, counted them in and we were away. Two brave young women who’d sung in the community radio gig earlier that week agreed to join me with microphones in the centre of the space to lead the singing (they were very reluctant but fortunately for me acknowledged that me singing Fataluku words on my own wasn’t really appropriate, or as convincing). Forever Young was a hit. As with our earlier song, no-one really joined in with any kind of audible gusto, but many were singing along quietly – I could see their lips moving! The guitarists held the accompaniment together well, and the boys on the chime bars also kept time remarkably well, given the density of sounds going on for most of the time. The ANAM musicians also played solos during the instrumental breaks, with the two singers holding microphones to their instruments so that the solos could be heard. Even Tony got to sing into a microphone at one stage, one of the girls came and held it beside his mouth during one of the choruses. The rest of the time he kept our drum groove going on the djembe. The Many Hands staff took part in the event, and reported back that at least 200 people had taken part throughout the event with a further 300 moving in and out of the space. 500 people having some experience of this event is a wonderful outcome! “Do you like this? Do think it’s good?” Mana Holly asked different people in the crowd as she roamed around with her camera. “It’s great,” they told her emphatically. Mana Kim also spoke to a number of people after the event and reported back that people had been overwhelmingly positive and excited about the event. The only negative comment was that it was the kind of event that should be happening often, not just as a one-off. One person (connected with local police I think) felt that events like this could help to reduce crime, and yet another person suggested that it was a good way to combat racism towards malae (foreigners), explaining that this was something that was on the increase. It was the first time people had seen malae and local Timorese working together in a participatory event like this. People also appreciated the instruments that were in use – they were happy to see their traditional instruments being promoted by outsiders, but also that many of the other instruments were made from things that were easily available locally – buckets, bottles and bamboo. At the end of the jam we handed the floor over to Plan International, who have been running a music recording project for some time in Lospalos. Several of their bands had come along, and they now performed sets of their songs. They sat in the centre of the room, one of the Motolori boys taking the initiative to sit in the middle of them and be a Microphone Stand (and at the end of each set jumping to his feet to yell “Thank you very much!” into the microphone like a pro), and the audience crowded around to hear these performances too. I made my way to the edge of the market space and sat down with Sarah (who was looking pretty wiped out from her malaria, but sticking with the gig nonetheless – what a trooper) and Oswalda and two of her friends. They congratulated me and asked how I was feeling. “I’m tired now,” I confessed. The three young girls then grabbed hold of my arms and proceeded to give me an arm massage. Tony and some of the Motolori boys walked home, carrying all the instruments on the two wheelbarrows we had borrowed from our neighbours. I followed shortly after, and when I got home I was surprised to see a group of other neighbours (none of whom had been at the gig) crowding onto th verandah. They were awaiting our return, it seemed, keen to have their own Toka Boot on the veradah. How could we refuse? We watched with pride as they set up the instruments – with care and respect now, unlike the chaotic handling things received in the early days of the verandah jams, and began to play. They were jamming on their own, without guidance from us. How things had progressed since that first jam, when Kamil, our Indonesian friend, had to go out into the street to persuade some of the local children to join us! Now they were waiting for us when we got home, and the only way to get them to stop playing once they started was to call for a break, explain that we needed a deskansa [rest], and reassure them that they could come back tomorrow to play some more. They would then pack up the instruments with the same care and attention as they gave to the unpacking – putting the chime bars back in their bags in the right order, painstakingly counting out eight mallets per carry bag, gathering all the kakalo sticks into their little red carrier bag and entering the music room at the side of the verandah respectfully and (for the most part) without pushing each other, and placing the instruments down in their correct places (most of the time – some of the bamboo sticks still got dropped on the floor on occasion).